I wanted to let you all know that I will NOT be updating Avril-L.org until Monday (June 17) night. I will be going to Toronto to attend the 2013 MuchMusic Video Awards! Follow me on twitter @AvrilLorg and I will be tweeting from the MMVA's on Sunday night. I can't wait to see Avril perform "Here's To Never Growing Up" LIVE! These are the events that Avril will be attending this weekend. Monday night I will post pictures/videos. The secret project has started! 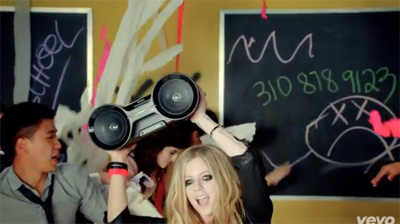 The phone number 310-878-9123 as seen in the HTNGU video has been updated with a first mission! 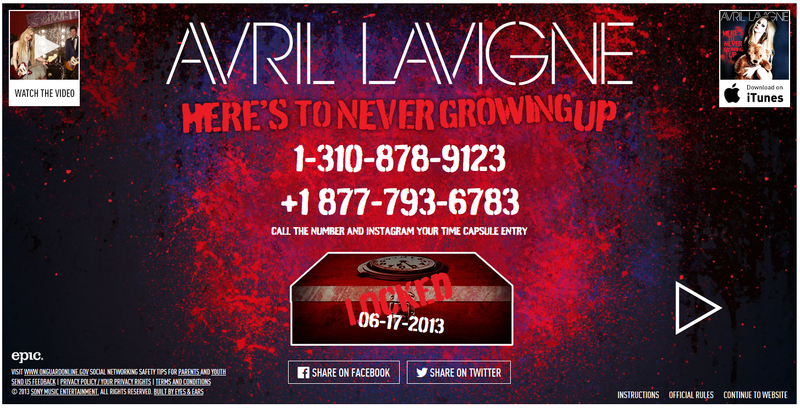 If you are not able to phone the number, dont worry, AvrilLavigne.com will post the mission every Monday. Please remember that the contest is only open to those in the USA or Canada, but you can still submit a picture if you don't live in those countries (you are just not eligible for the grand prize). Avril performed "Here's To Never Growing Up" (a shorter, cut version) on LIVE with Kelly and Michael! It was recorded on Wednesday, but aired this morning. Sounds great, as always! A new, shorter version of Avril's Uni President Ice Tea commercial was recently released. Avril and Chad attended the 44th Annual Songwriters Hall of Fame Induction Ceremony in New York last night. Avril was on hand to watch her fiance person perform "Sweet Emotion" by Aerosmith. I love her firery red dress! They complement each other nicely. Lovely evening at the Songwriters Hall Of Fame Tonight. So proud of my man, watching him crush SWEET EMOTION by Aerosmith!! New York Post: "EXCLUSIVE: Avril Lavigne on how Chad Kroeger proposed, new music and her run-in with Amanda Bynes"
People Magazine: "Avril Lavigne 'Enjoying Every Minute' of Wedding Planning with Chad Kroeger"
"I've been very busy planning the wedding, but I'm enjoying every moment of it," Lavigne, 28, told PEOPLE at Tuesday's Nylon magazine and Aloft Hotels concert celebration at New York's Highline Ballroom. US Weekly: "Avril Lavigne Chad Kroeger Wedding Planning: "It's Out of Control""
"I'm the one who has the crazy vision and he's letting me be me," Lavigne, 28, said of Nickelback's Kroeger, 38. "I just want to make sure I really enjoy this amazing time and I want all the guests who come to have this once in a lifetime experience. I want everyone to say 'Wow!' and for it to be special for everyone, not just us." Avril attended the Nylon Magazine Cover Issue Party in New York City tonight (June 11) to celebrate her June/July cover! Avril also performed at the party. Canadian singer Avril Lavigne will join the World Peace Concert to be held in Hiroshima from July 27 (Avril performs on July 31) ahead of the 68th anniversary of the 1945 atomic bombing of the city on Aug. 6, the prefectural government said Tuesday. Composer Ryuichi Sakamoto, singer Saori Yuki, pianist Stanislav Bunin and music producer Quincy Jones will also be among performers at the event, which will run through Aug. 5 and feature concerts in several genres of music including pop and classical. "We intend to send a message of peace from Hiroshima to visitors," Hiroshima Gov. Hidehiko Yuzaki said. Avril will be performing at the Nylon Magazine June/July Cover Issue Party on Tuesday, June 11 in NYC! Tickets available here. Tune into The Voice UK next Saturday, June 15 to watch Avril performing "Here's To Never Growing Up" on their finale! It will be pre-recorded as she will be performing in Chicago that night. Since I will be in Toronto for the MuchMusic Awards, I won't be able to post the video right, but come back Monday June 17 in the evening for all media (The Voice UK, Chicago show, MuchMusic Awards) from that weekend. Avril was photographed leaving the Corinthia Hotel in London yesterday afternoon (June 5). Avril and her band doing to dinner at Nobu in London (June 5). Out and about in London today (June 6). I still have no idea what Avril is doing in the UK. With her band there, she is definitely doing some performances, but nothing has been announced. Why so secret I wonder?